Welcome to my Abbey Pages! Posted here are photographs and links to holy sites in Britain, across Europe and into the Middle East. These pages showcase the Photochrom photographic collection, a group of thousands of photographs taken between 1890 and 1910. These photographs are in the public domain, now, and I have selected the best photographs of Abbeys, Cathedrals, Churches and other holy sites, as well as spectacular castles (see my Castle pages), folk in traditional costume, and miscellany of interest. Click here to visit my Photochrom Collection on Historyfish. Click here to go straight to the Photochrom Abbey Pages. An article about Abbey Ruins. Explore Beaulieu Abbey and learn the Parts of a Medieval Abbey. Visit my Monastics Pages, with full text and illustrations from Gasquet's English Monastic Life. As time allows, I will add in information to go with the photographs, and interlink them with my Monastic Pages. 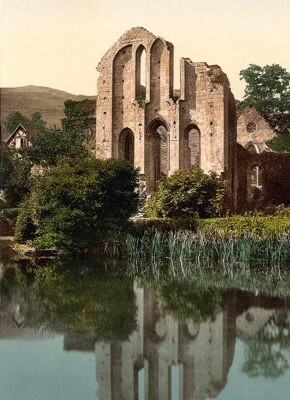 I also have some links on the Photochrom Abbey pages where more information about a particular Abbey is available on Historyfish. Lots of good stuff here, and this site is a work in progress, so check back. A note about photographs and permissions: Unless otherwise credited, all the photographs on these pages are from the Photochrom collection, Detroit Publishing, or other collection, and downloaded from the Library of Congress website. As such they are in the public domain and available for general public use and publication. Please contact me if you have any questions or concerns regarding copyright. Put 'historyfish permissions' in your subject heading. Click here to learn how to make a photographic print from these files.